The USB charging sockets are compatible with items such as Smartphones, Music Players, Cameras, Tablets and other devices that require charging via a USB port. The USB charging sockets are limited at 2 Amp for both ports, with intelligente current control which allows up to 2A on one port only. If the current exceeds this it will automatically trip off to protect your device. 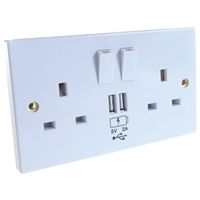 The wallplate also features 2 switchable UK 3 pin power sockets and will fit any standard back box (minimum depth of 35mm). 1. Firstly, ensure you isolate the mains power supply and remove the fuse in the fuse box or switch off the circuit breaker in the consumer unit. 2. Following the diagram over-leaf pass the cable through the entry holes and connect to the relevant area. 3. If an Earth loop connection is required, use the additional earth terminal block located in the back box. 4. 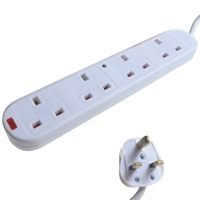 Re-connect the mains supply when the installation is correctly completed.